After making two Spider-Man movies that were widely torn apart by fanboys, Marc Webb seems glad to be back in the world of independent films. It is that world that made him known as the young director of 2009's winning romantic comedy (500) Days of Summer. He turned that film's success into two big paydays on the underperforming/hit Andrew Garfield superhero movies. And now Webb is back to making small character studies, from spring's well-received Gifted to the brand new The Only Living Boy in New York. The second 2017 film to take its title from a Simon & Garfunkel song, Living hails from screenwriter Allan Loeb, who up until now has largely worked as a contributor to major studio fare, from Adam Sandler's Just Go With It to Will Smith's much-maligned Collateral Beauty to the worst 2017 film I've seen thus far, The Space Between Us. Living feels like the work of a first-time screenwriter trying to make a name for himself, but it might be more accurately be described as the work of a seasoned and unloved screenwriter trying to clear his name with something small and character-driven. Loeb does not achieve anything of the like with this pretentious and laughably contrived tale that wants to be the modern-day equivalent of The Graduate. The film opens with some narration from a character we will come to know as W.F. 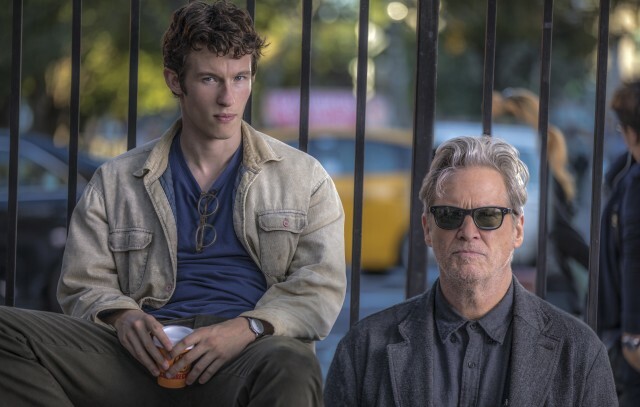 Gerald (Jeff Bridges), the all-knowing neighbor of our punchable young protagonist, Thomas Webb (Callum Turner). A privileged apparent graduate of Columbia University, Thomas is trying to make sense of adulthood in a dingy apartment in lower Manhattan, on the opposite end of the borough from where his parents live. Though he supposedly tutors to make a little cash, we never see it and Thomas spends his days sipping liquor and telling wise but enigmatic new confidante W.F. all about Mimi (Kiersey Clemons), the crush who's friend zoning him, and his parents, publishing tycoon Ethan (Pierce Brosnan) and cancer sufferer Judith (Cynthia Nixon). One night while out with Mimi at a drag show, Thomas catches his father on a date with Johanna (Kate Beckinsale), a woman much younger and more glamorous than his mother. Thomas begins following Johanna on the subway and from her workplace, eventually confronting her and pleading with her to end the affair with his father. Instead of doing that, Johanna starts having a second affair...with young Thomas. Thomas confides in W.F. about this vaguely Oedipal romance, but he lies about it when Mimi asks him about it. She's about to move to Zagreb, Croatia anyway. The film delves into this love triangle strictly from Thomas' perspective, before revealing that W.F. is not quite as far removed from the rest of his life as he thought. I'm kind of relieved that Living only feels like it comes from the mind of a wide-eyed newcomer for whom Thomas stands in. Whereas Thomas bristles at his father's description of his essays as "serviceable", Loeb should be quite used to critics having much harsher words than that for him. This is such an unlikable and poorly written movie from start to finish. You hold some hope early on, as W.F. 's narration laments the loss of New York City's soul and character, where classic concert venues are replaced by Urban Outfitters and SoulCycles. Your initial impression is that this could be the work of a Woody Allen type who was nostalgic for Woody's heyday rather than the heyday of jazz and radio that he pines for. There's even Wallace Shawn at a table for a dinner party. But even having someone as lovable and avuncular as Bridges cannot make bearable these chats between confused Thomas and his mystery sage. There isn't a single thing to make us empathize with Thomas, not him worrying about how Dad's affair will hurt his mother nor his pursuit of Mimi or Johanna for that matter. Johanna is named Johanna only so W.F. can quote Bob Dylan's "Visions of Johanna" and then we can hear that song. The same applies to the titular Simon & Garfunkel track, which we know it's only a matter of time until it pops up. The twists at the end of the film are presented as some kind of brilliant Sixth Sense type shocker, but they've been set up at length in scenes that only make sense if they were going to lead somewhere. The big reveal is not exactly inevitable, but without it, the movie would be ludicrously hollow, even for an indie running just 88 minutes. Webb may enjoy making this kind of movie more than dealing with the bigger budgets and more intense scrutiny of the Amazing Spider-Man movies, but he doesn't prove himself as being better suited for such an outing. His work resembles Zach Braff's Garden State only without anything that will resonate with audiences the way that 2004 sleeper did. Turner, who resembles a young Richard Gere and does an admirable job of hiding his British accent, does nothing to endear to us in his biggest role to date. The more seasoned pros do not help matters either. Beckinsale can't do anything to make her character anything but wildly unrealistic. Brosnan gamely tries to get through tasks like a fakeout concern and an over-the-top overreaction. It's tough to imagine how much a lesser actor than Bridges would make W.F. the biggest blowhard of the year. Critics ragged on Collateral Beauty for its reliance on sentiment and manipulation, but Only Living Boy offends way more by having those same undesirable qualities without any tasteful performances or genuinely moving moments to make them easier to swallow. It's just an uncomfortably off-key coming-of-age tale that never finds anything close to a compelling reason why it should have been told instead of any one of the thousands of unproduced screenplays floating around in Hollywood. Though it is a product of Amazon Studios, who has quickly blazed a trail with prestige projects, there is nothing prestigious about this film, which should fail to find an audience in limited release after failing to win over critics. And with this, the Simon and Garfunkel Cinematic Universe has crumbled before it could even take off.